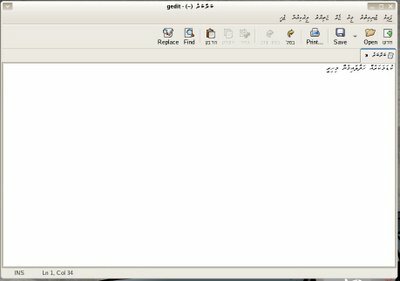 This is still an experimental work in progress for the translation project for GNOME. Aim of the project is to have a functional UI in Dhivehi for the Linux OS. Hopefully. Its a Friday and its a Friday. Anyone wants fries with that? We've planned an initial meeting for the discussion of the translation project. as well be interested in coming over. Props: MRF 20/- for the coffee. I'll keep it organized. Meet you then. Thank you!. Been working on this dhivehification for gnome for the last few days. Mostly experimenting. Finally I think I now know how to setup a working model and a path. Meaning what is needed and how to go about this. Today I was able to transform the GUI to have the widgets mirrored so that we would have the RTL looks, etc.. 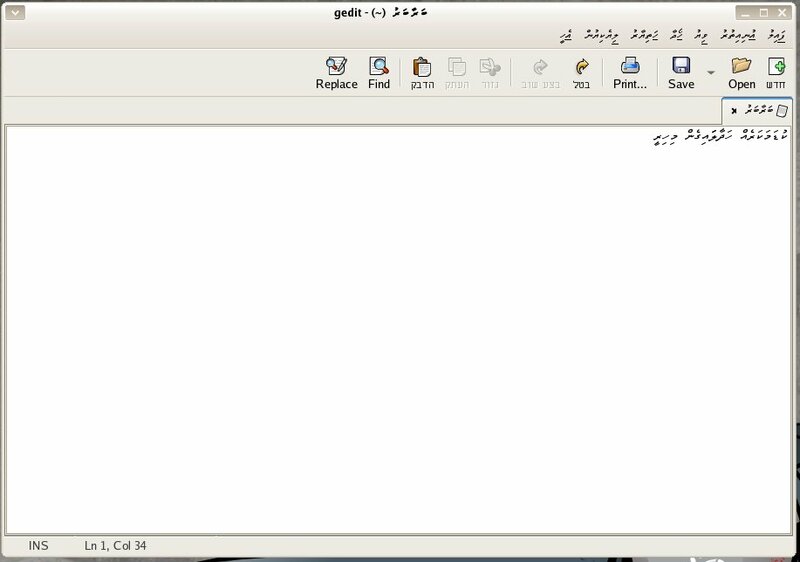 The screen shot posted here is using a po file I edited for gedit for thaana and Hebrew gtk20 mo file. This file is responsible for the RTL stuff on the widgets, tool bars,menus etc. I have not started work on our own version of this file yet. Also the dv_MV file bug issues are still pending. Good news again is we are moving, progress day by day. What is lacking is man power as of now. It would really help if others took interest and joined? aaah, in anycase lets see how things go. I like to be optimistic what ever anyone has to say about these kinds of work; what the hell its fun anyway. This is work in progress. Still a lot to be fixed. Good news is now we can start work on the translation. Also need to fix the Right to Left stuff. Ah! my work is done for the day; need a rest. Ok, here is the screen shot of the first dv_MV locale test. I know its wrong and still far from complete, but its started. So now I just need a few more days and some extra help before I can upload the first version. Today we got the following mail; which really made me happy. This means we are officially added to the gnome translation project . Inn and I are now involved, but we hope to get as many helping hands we can get. First thing I think was to correct the name from Divehi to Dhivehi. I think the reason for this mistake is cos its listed as Divehi at ISO 639 registration authority. So I have already requested this to be changed. As i have posted in my previous post nothing can be moved before we create the locale, so first thing is first. Also inn has setup a mailing list and the MLUG web site back up. So if anyone is interested please sign in to the list. We hope to make this a platform for us to communicate. 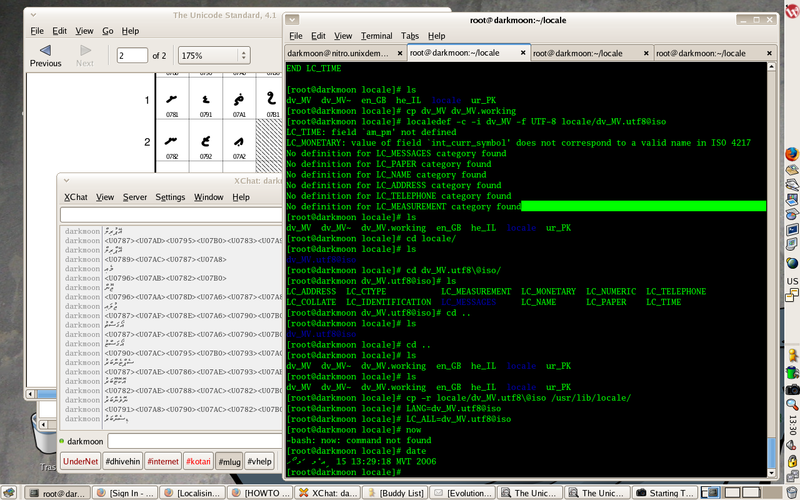 with the recent linux distro's thaana enable keyboard is shipped, I have tested on ubuntu and fedora. this is a very good improvement, should have done this long ago. anyway so what's the next step? after having a few chats with people who are interested I decided to go on with localization project. been try'n to do it for long; but did not find the time. so where goes. tonight I signed up with the gnome translation project after having a look into the translation teams did not find an entry for thaana or dhivehi. so I thought i'd sign up and start. this is middle of the night; almost morning. and wala after about one hour or so my dear old friend inn calls up. hmmm! asking me about the mail. I was happy to find out he had already signed up for this and was waiting for an answer. this is good news. guess i am not the only one and even the first. this is good. here is mine: when all CEO's of all major companies of Maldives will be orin. all ministers will be orin and we have to pay our rents to orin too. We will go to ori land and serve as maids and labors and get paid 110 USD. when our national anthem will be sung in ori bas. we will teach in ori medium. all ladies will wear ori saalhi. our names will have the initials fanando, etc. all maldivians will smell like orin. This is a common case at work environments. No longer the sys admins are stupid. They can monitor and block all most all traffic in and out of the network. Well; hmm! Even if they are not smart enough, now we have very cool software's (farewells) that can do it. But does this stop you from going in and out? Well to some level yes and no. ok, here is one case. Lets say; like in my case irc is blocked. hmmm! easy ey change port? No its not just port blocking. In my case its blocked at the protocol level. the firewall filters all traffic and looks for any irc stuff. this makes it impossible for you to get in even using a BNC. so now what? here is one solution. where yourshell.com is where you have a shell account access. once you do this, you'd be asked for the password and now you are having an established connection. now what's next? Simply run xchat and type /server localhost. so what's the point? well on a shell too you have things like BitchX; but not a GUI client running locally. thats it. enjoy. Some things are better left unknown. When you get involved with some things and you find out how people plan; it gets into you. Makes you wonder about what they do, and some times why they don't do things. You wish you can change that, but better not. Its not your business and if you peek in, you become part of the loop. I encountered such an event today, and I so much wished I was not there at all. I wish I did not hear what I heard and knew. Its much better to be left in a corner; with a box to play with and a good internet connection. That is the best thing you can ask for. Read; learn and try. Nothing like R&D jobs. I just heard this statement "Just remember, no to everything". This came from some people across the room, just before they left for a meeting. Now that's something I learned some times back; guess I am not the only one. But to be honest, I don't even want to be the one who will have to say "yes" or even "no". I think I am more happy to choose what I like to do and do it. Dump anything I don't wanna get involved with. I'd rather not know all the crap and feel helpless and frustrated cos I got to know something. Its not my job, so why should I even care? But still it gets into you. I repeat ; it makes you wonder how some people "think"! daaa! err! err! Core dumb! End. Today Wataniya has launched the first thaana sms for its customers. This is enabled using a midlet. It works fine on most of the phones in the market; O2 phones are among some of the phones which does not support this yet. Once a SMS is compiled using this application; you can send the SMS to just about anyone (again to most phones). Even if the other person does not have the application installed they still will be able to read the SMS in a kinda letin format. One of the hardest things that you face is to say "no". This is true for some people and for others; its the opposite. I have sat down at meetings with some people who's very first word is "no". You propose anything or ask a question; the answer will be "NO". At first I really hated this; but at later stages started to realize that this is a better approach. At work; especially when you work to provide others solutions. Everyone comes to you with their problems. If you start to say "yes" to all problems, then the end result is you will end up not providing anyone with a solution. So here you have to choose between priorities and stuff. Thus resulting to say a lot of "No"'s. And this is no easy job as it sounds. You don't want them to say "no" to you, when you go to them. So the trick here is you have to put it in such a way that, the "no" does not come back to you. Well.. "NO"! Well; one area where Linux is really bad is support for Wi-Fi cards. There just have not been good support for this in Linux so far. I don't think we have native support for this in the kernel (yet). I tried to get mine working but it always gave me issues, and finally I did not want to waste enough time trying to fix it. I hope this will be fixed soon. I guess this is one the way. There have been few good developments on the Wi-Fi support for Linux lately. This is a wonder; I've been coming to work and now living in hulhumale' for more then a year now. This mosque was being constructed back then too; and even today. 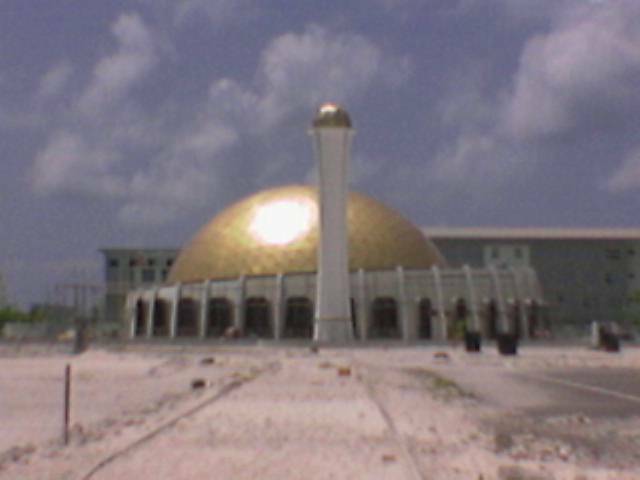 This is one of the first constructions that begin in the island. I was also told that this is funded by some Arab country (assumption: so no money issues must be there ). I was born today 31 years ago. geez! Today, the week started off with a Monday. Seems yesterday was celebrated as the day Maldives converted to Islam? hmmm! When? Who? daa? No one really knows what happened, but still we know the date; cool ey? Anyway, not my problem. Why should I even complain cos I had 3 days off. Finally I got what I have been working on for the last one week done. I liked the project, and I think end of it was just the start of another major work. The thing I like about these kinds of projects is that it does not involve dealing with DB's. No forms; or fancy looking web pages. Just good old plan backend processes, and cross platform connectivity. A nice java front end, that can run on anything; from a web browser to a mobile phone, backends with Perl and python. 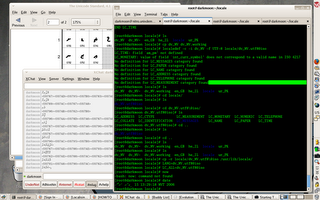 Next a combination of GNU tools; running on Linux. This is far more exciting for me then digging into SQL and playing with style sheets. Anyway I am looking forward to the next level of this work; I think I'd really celebrate once this one is done.